We are very pleased to announce that Eva Proudman has joined our team at The Maitland Clinic. 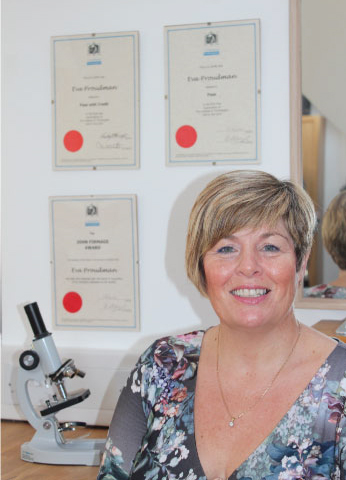 Eva has over 17 years experience in the hair loss industry as a Trichologist and hair loss specialist and will be seeing patients in both our Hampshire and London clinic for consultations. With the increased options available for treating hair loss and scalp issues we felt it was important to team up with an experienced specialist dedicated to helping patients. We have seen a significant increase in enquiries from patients concerned about general thinning of hair over the years or sudden hair loss and Eva is perfectly placed to offer the best advice for non surgical treatments. In most cases it is best policy to explore all non surgical options when the patient has generalised thinning, if we can see an improvement in the hair caliber after treatment it can make for a really positive improvement in the patient’s appearance and confidence. Hair Transplants are rarely an option if the patient is in an early stage of hair loss where the caliber of hair is reducing rather than the actual hair count. Transplanting into this area would be challenging and could cause shock loss to the pre-existing hair. It is important before offering a treatment to understand the cause and Eva will work with patients to understand this and make a diagnosis. In the vast majority of cases of men that we see the hair loss is genetic but with female hair loss the causes are much more expansive and a diagnosis needs to be made. Eva had this to say about joining the team. Dr Edward Ball and his team at The Maitland Clinic offer the very best in hair transplant surgery, looking after their patients and getting the very best hair results are their number one focus, with results that speak for themselves. As a Trichologist my aim is to offer the highest standard of service to all of my patients, so working with the team at the Maitland was a natural fit. I can offer diagnosis and advice to those not suitable for transplant surgery, and can work with the team at the Maitland to offer the latest clinical services such as PRP, as well as the very latest in non surgical hair integrations and replacement systems. As a team we can offer total hair loss solutions from the non-surgical through to the very latest in hair replacement techniques.